Investors are about to absorb US$131 billion of Treasury note auctions at the lowest yields in months, after they piled into U.S. debt following a dovish Federal Reserve decision and fresh signs that global growth is weakening. He’s focusing on the data this week that are leading indicators, like housing starts, to see if the economy is actually faltering. Bond investors seem to be leaning in that direction, even as the labor market is the tightest in decades. 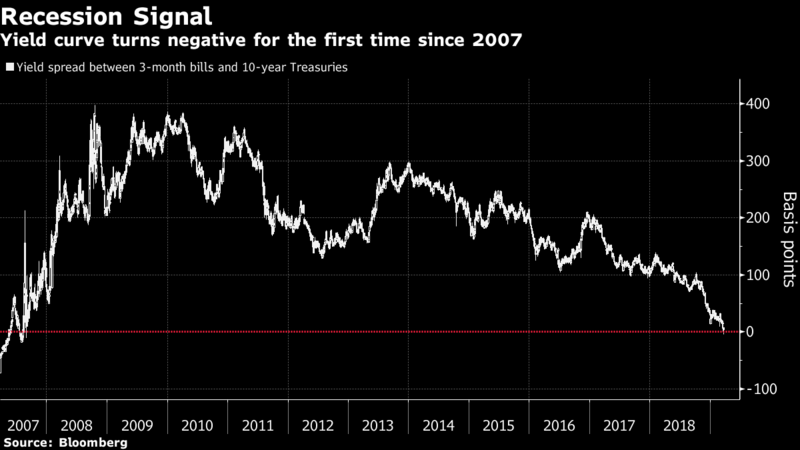 The benchmark 10-year note yields 2.43 per cent, close to its lowest since January 2018. Giddis sees it ending the year at 2.25 per cent. Money-market traders are also ramping up bets that a rate cut is coming, even as policy makers still have their next move penciled in as a hike in 2020. Fed funds futures show traders see about an 80 per cent chance of a quarter-point easing this year, up from about 30 per cent early last week. Treasury futures trading was active from the open in Asia with volumes running at double the normal for the time of day, while the 10-year bond yield fell one basis point to 2.43 per cent.